Clients can avail from us a precisely designed Pet Blowing Machine. 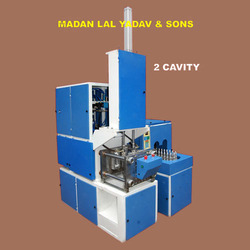 The offered machine is designed using high quality raw material and cutting-edge technology by our adroit professionals. Further, the raw material we use in fabrication process of this machine is sourced from reliable sources of industry. Also, we properly pack this range in safe packaging material to ensure its defect free delivery at client's' premises. Keeping in mind the diverse requirements of our clients, we are engaged in offering Pet Blowing Machine to the clients. Our offered machines are made from quality approved metals using cutting-edge technology. Moreover, available with us in various specifications, this entire range is widely used in various industrial packaging applications. Looking for Pet Blowing Machine ?